Now Accepting Applications from 2nd, 3rd and 4th year Education students! Exciting news! In order to ensure a wide range of participants, SCIC has decided to open up the eligibility criteria to include education students in their 2nd and 4th years of study (in addition to 3rd year education students) and to extend the application deadline. If you are a 3rd year student who missed the initial December deadline, you can still apply by January 2nd, 2017. 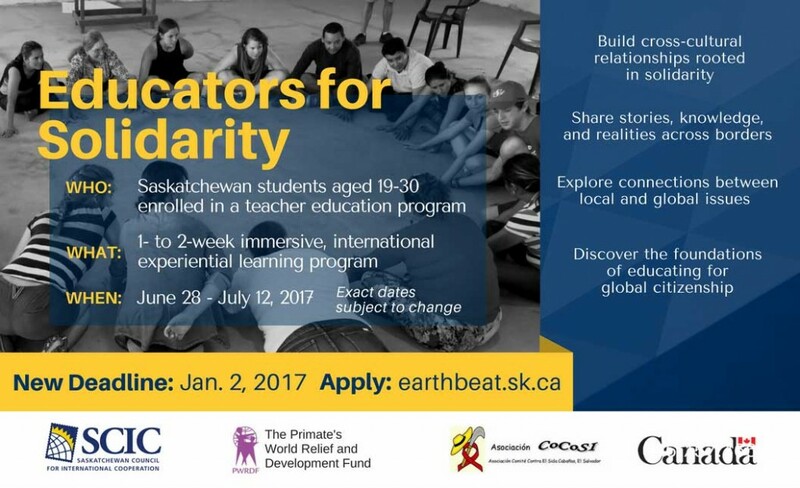 The Educators for Solidarity initiative is an opportunity for Saskatchewan post-secondary education students to see first-hand the work of SCIC’s member agencies on the ground, to learn about international development and global citizenship education, and to build meaningful cross-cultural relationships within and across borders. We are excited to work with pre-service educators because of their unique positioning at the beginning of your professions, eager to learn about multiple ways of knowing, teaching, and being in the world. SCIC is excited to announce that we are partnering with the Primate’s World Relief and Development Fund (PWRDF) and the Asociación Comité Contra El Sida Cabañas / Commitee Against Aids (CoCoSI) in El Salvador for the 2017 Educators for Solidarity Initiative.